Celebrate Black History Month at your library by exploring the histories of African American incorporated towns of Prince George's County. 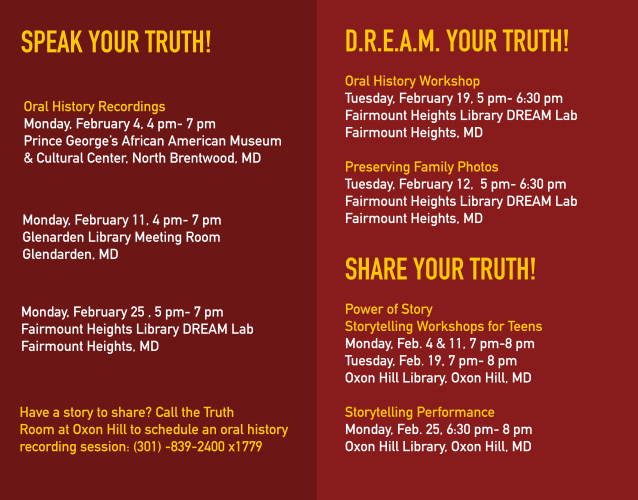 Celebrate Black History Month by highlighting the historically African American incorporated towns of Prince George’s County: Eagle Harbor, Fairmount Heights, Glenarden and North Brentwood. Speak, Dream, Share, and Preserve your story throughout PGCMLS as we record oral histories, share community stories, and preserve family memories. Leading up to the 65th Anniversary of Brown v. Board of Education, PGCMLS is celebrating Black History Month by highlighting the historically African American incorporated towns of Prince George’s County: Eagle Harbor, Fairmount Heights, Glenarden and North Brentwood. This map is intended to bring history to light using sights and sounds from County residents and PGCMLS' Sojourner Truth Room. We welcome you to share your knowledge by adding your own pin!